Sorry to say, but the Good Friday Cookout (originally scheduled for the Heff College Courtyard then move to Audubon Park) has been canceled, and will not be rescheduled. As you may have noticed, the pedestrian bridge across Southern Avenue is taking shape. The general contractor, Flintco, has notified us that additional action is now necessary that will affect vehicular traffic on Southern Avenue. Over the next several weeks, crews will be working on the bridge above Southern Avenue and the railroad tracks, welding, pouring concrete, and installing the suspension cables. This work is scheduled to be completed by late March, at which time Southern will reopen. Beginning next Monday, February 11, Southern Avenue will be closed indefinitely to vehicular traffic between Houston Street and Goodman Street to allow work on the bridge above Southern. Additionally, Echles Street will be closed between Southern and Spottswood. Traffic will be detoured to Patterson, Spottswood, and Goodman. Please note that this schedule could be affected by weather. The 2019 Fall Herff College of Engineering Career Fair will be on Friday Sep 20, 2019 from 8:30am - 11:30am. In an email from Dr Rudd (Dated Mar 8, 2019), it was announced that Chartwells will be the new on campus Food Service Provider starting in Fall 2019. Check out This YouTube Channel for over 500 fee online lectures and illustrated examples for electro-mechanical technology courses. Also check out This Website with all sorts of online simulations and demos (all related to Eng Tech Classes. The engineering peer tutoring schedule for the spring is now posted. Tutoring will start on Tuesday. All tutoring takes place in EA304. You can always find an updated tutoring schedule on the college website, as well as, other resources. 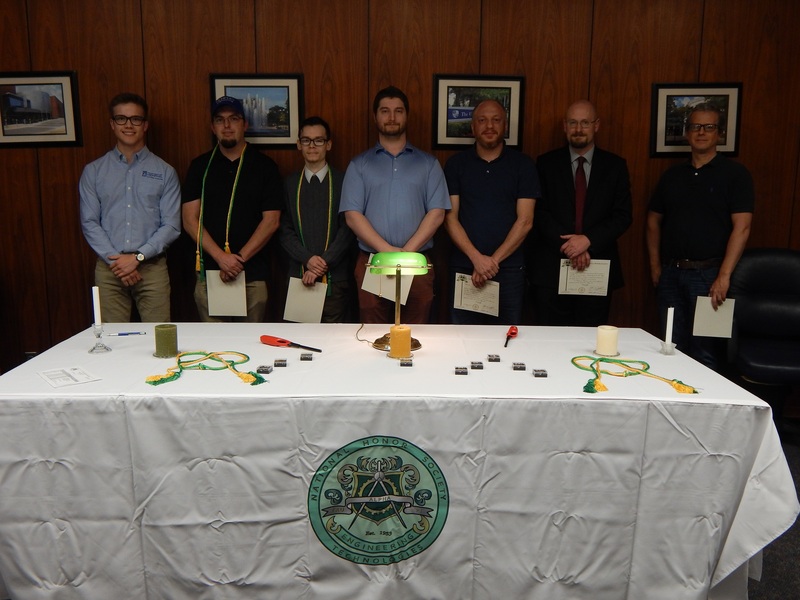 On Wednesday April 25, this year's new members to National Honor Society for Engineering Technology - Tau Alpha Pi at the University of Memphis were inducted. These students represent the upper 10% of all Engineering Technology Students. Please join us in congratulating our latest Honorees. 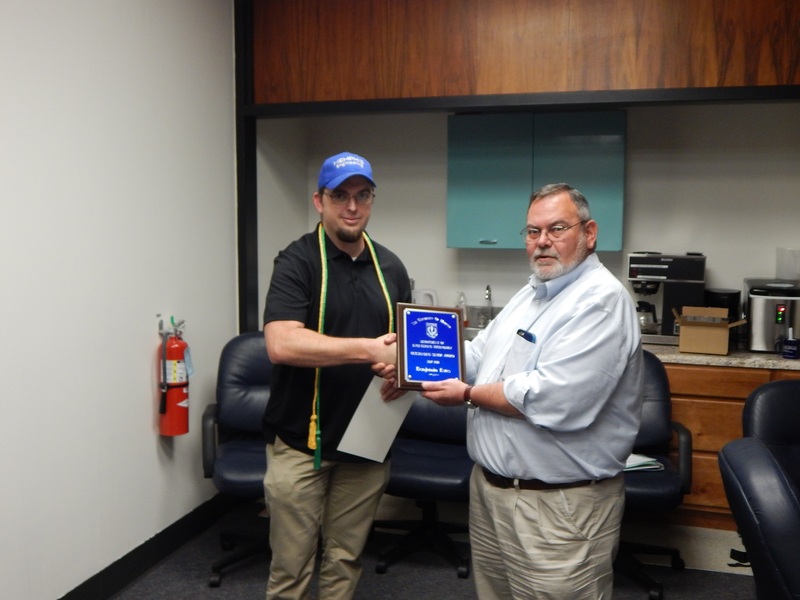 The Department of Engineering Technology has recognized Benjamin Estes as the Outstanding Senior for 2017-18. Please join us in congratulating Ben! As a UofM Student you have access to Microsoft 356 and OneDrive (cloud storage) from your email account. Login to your email and click on the box in the upper left hand corner of the page to access. You can also install Microsoft Office for free. Open your email, and click on the menue icon (upper left hand of the screen). Then select "All Apps" and go to the bottom of the list and click on "Explore all your apps". Look for the "Install Office" button and select "other install options" and then select teh language and version and hit install. Go to "downloads" tab and click "my school webstore"
Type "university of memphis" and click the first pop-up "...-information technology"
Click "on Visit the webstore"
This should give you access to download software (you will have to log in with your UofM Credentials if you are off campus). Make sure you note the licence key! The University of Memphis now has a site licence for MatLab. UofM students are eligible to download and install MatLab products on their personally-owned computers. Goto the The University of Memphis MATLAB Portal to download. You can also access free, self-paced training to get started in less than 2 hours: MATLAB Onramp. Autodesk, makers of Autocad and Inventor, gives students their software for free. See THIS PAGE for details. Do you know what you want to do for senior projects but don't have the equipment or money to buy it? I have acquired many items over the years that can be used for EETH and CETH senior projects (see link below). I also have a number of computers that can be used by students for senior projects in ET227a for your use in case you need software not installed on the image in the computer labs, or you need Linux or another OS.